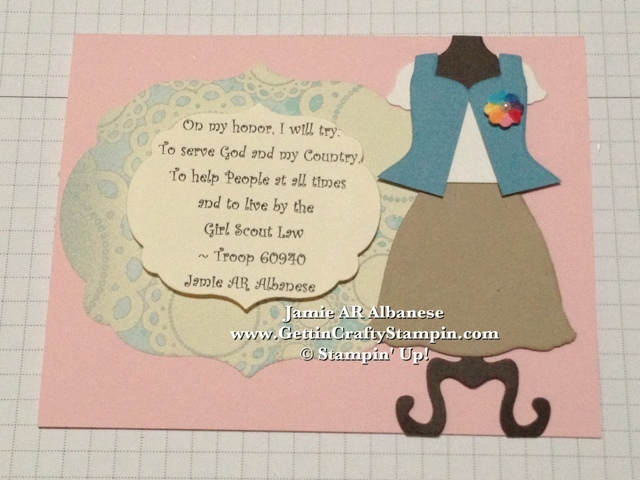 My Girl Scout Daisy Troop. 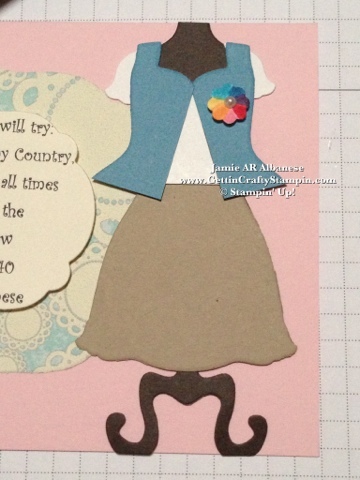 With a Pretty In Pink card stock base, our All Dressed Up Framelits Dies (Spring Mini), Crumb Cake, Whisper White, Marina Mist and Chocolate Chip card stocks... these dresses now resemble our school's uniforms (tan bottoms, white polo's) and their pretty vests! My Daughter said it was cute but missing the large rainbow daisy. Whipping out our Itty Bitty Shapes Punch Pack and the little flower punched out of Whisper White card stock. 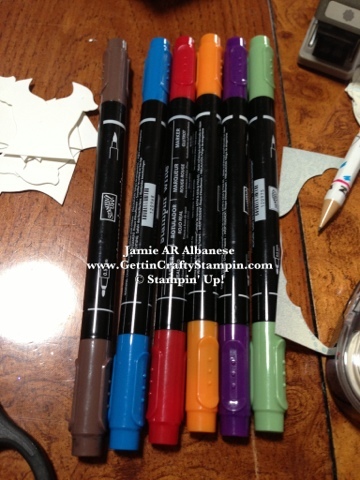 Our Stampin' Write Markers color in the petals that they earned. 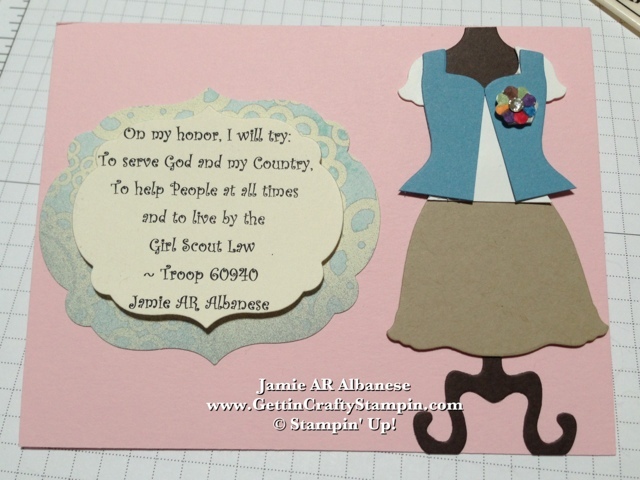 EVERY Girl Scout, from new to older, can recite this saying from memory. I like what it says. Here framing it up in our Labels Collection Framelits and Big Shot creates the perfect layered look, easily! The More Amore Specialty Designer Series Paper (Spring Mini) in this lacy, doily, blue patterned paper is a perfect fit for this card. I'm sad to say, this will be my last year as a leader. 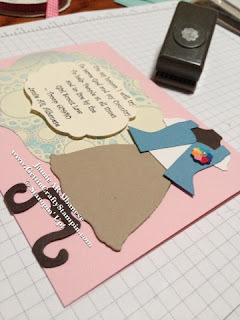 I created cards for each of the girls and wrote a personal note for them. As I wrap up this year, two moms will be taking over next years as they bridge to Brownies. I LOVE that I was able to be a part of their lives for the past two years. 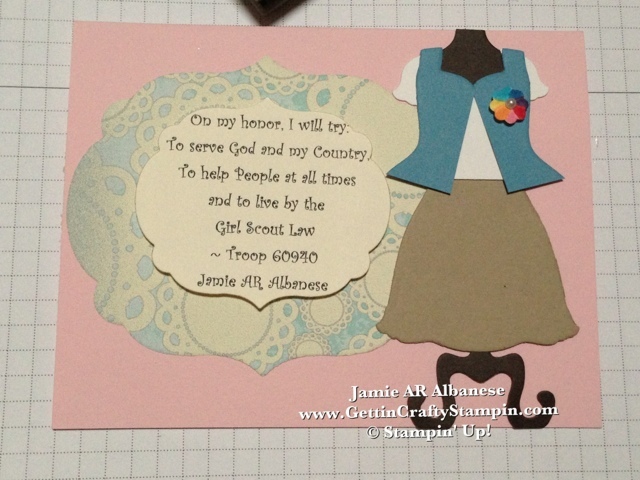 Breaking down this pretty Daisy Girl Scout card for you... 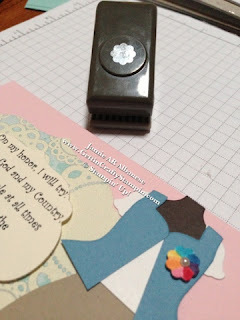 Here using ALL three pieces of the Dressed Up framelits, a collection of bright Stampin' Write Markers and a little bit of work... this comes to life. 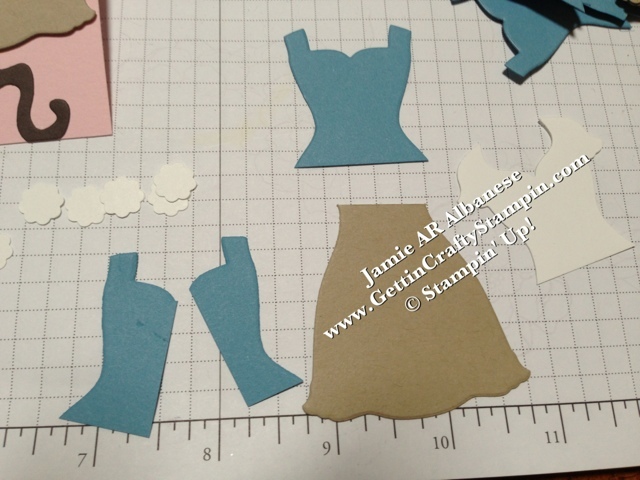 Cutting All three pieces and pulling them together is easy, if not for the many pieces - lol - for our 9 girls. The effort?! Well worth it, they are an amazing bunch of girls and parents. Girl Scouts celebrated their 100 year Anniversary this past year. 100 years of impacting, encouraging and strengthening girls all while selling some amazing cookies (lol). 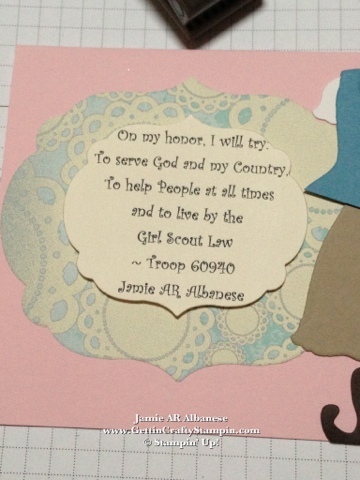 My troop had 12 girls at one point and I'm honored to have been a part of these girls lives. What fun it's been, an adventure I will never forget. Dress Up Framelits and Big Shot?!?! this is a MUST to have in your repertoire!